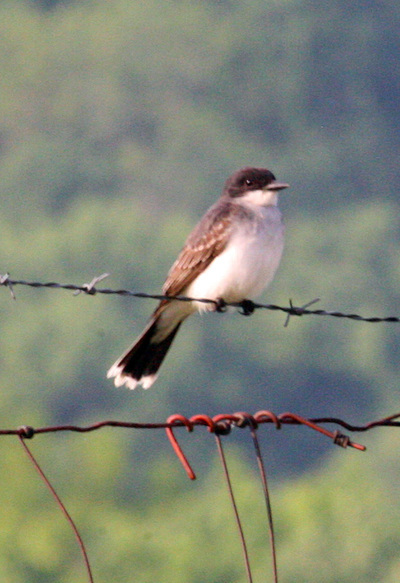 The Eastern Kingbird (Tyrannus tyrannus) is 8-9 inches in length. It has a black head, black upperparts, and a black tail with a white terminal band. It has a white throat and white underparts. It also has a patch of red feathers in the middle of the crown that it usually keeps concealed, but will reveal during territorial defense. The feathers of the crown are long which almost gives the impression of a crest. 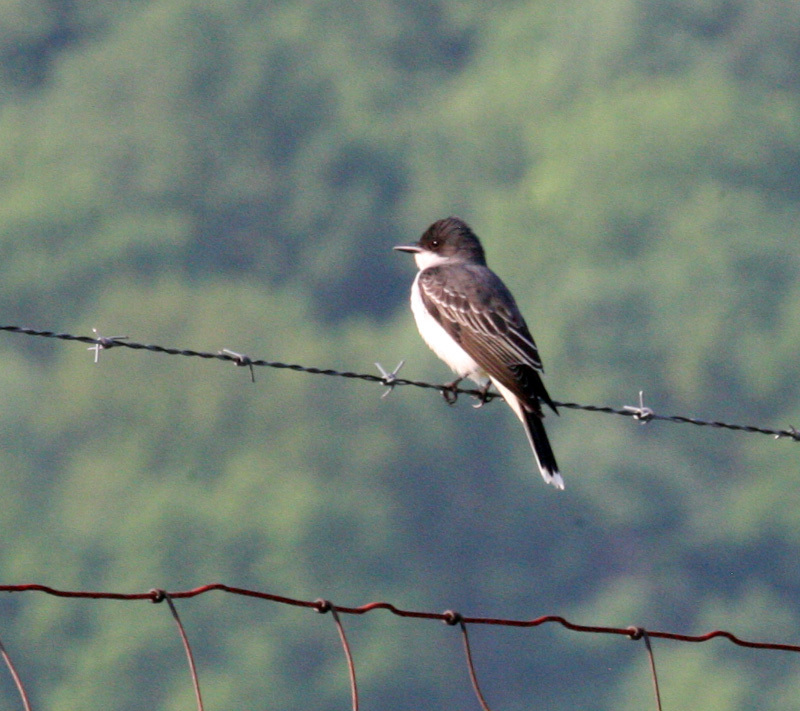 The Eastern Kingbird is found in open areas near forest edges, riverside groves, parks, and roadsides. It tends to perch in the tops of trees, fences, and utility poles. It is highly territorial and will quickly attack another bird that flies into its territory. They are known to be highly aggressive with other Kingbirds and with other species. They ferociously defend their nests and have been known to attack much larger birds, such as hawks, crows, and Blue Jays, but they have also been observed attacking squirrels whom they found to be a threat. Eastern Kingbirds eat mainly flying insects during the summer; however, it eats fruit during the winter months when it moves to South America. They sometimes take larger insects which they beat against a perch before swallowing them whole. Eastern Kingbirds have a complex vocalization that is a series of high-pitched sputtering and spitting sounds that is followed by a buzzy sounding zeer. Click here for additional information, vocalizations, and a range map.